This review begins, I’m afraid, with an apology. The Law’s delay (to paraphrase the Bard) is one thing, but a year for a book review? My bad. Unlike this review, however, news travels fast these days. Instantaneously in fact. But there’s so much of it that items are easily overlooked. Good quality news can be missed. Take Scotland’s own John McKendrick QC, senior counsel at the Bar in England but also (more significantly) an Advocate at the Scottish Bar. Now I’m a little surprised John’s appointment last summer as Attorney General for the amazing Caribbean Island of Anguilla went somewhat unnoticed here at home – something I hope this little review might help remedy. John’s sunshine and palm tree life as Attorney General can be viewed in all its glory on twitter @JohnMQC – easily the most transcendent twitter account you will ever come across, especially when it’s raining sideways back here in Blighty. John has the best job in the world, I tell myself, but even paradise has its problems from time to time, as Anguilla’s devastating storms reminded us. Those must have been difficult times for those charged with good administration, and no doubt the clear up work is ongoing: but having followed John on this, he deserves enormous credit for the way he has risen to those challenges – so if you’re reading this, John, I take my rain drenched hat off to you. But back to the review and… what was I talking about again? Ah, news. Back in the seventeenth century news took days or weeks to arrive, even from elsewhere on these islands. But it took months to arrive from more distant shores. Such as the West Indies. Such as Darien. Darien: a name to fire the imagination. Who, having read it, can ever forget Keats’ glorious poem, where he compares opening George Chapman’s translation of Homer to the experience of seeing the Pacific Ocean for the first time? Darien is like Xanadu, Avalon, Atlantis or El Dorado. It conjures a lost paradise, a place so perfect it can only exist in the imagination. There is something really deep in the Scottish character, I think, that draws us toward Darien: this distant place of perfection which – much like the 1978 World Cup in Argentina – was ours for the taking! Practical too: the idea of a great canal was in the minds of the colonists, even then. And yet how bitter the experience of that paradise proved to be. Scotland’s doomed bid for Empire in modern day Panama is one of the defining moments in our history. Its story has been covered by a number of writers, perhaps most notably by the great John Prebble in his work The Darien Disaster. McKendrick’s, however, as the title of his work implies, is not only a superb history of the Darien Scheme, it is also the author’s own journey to Caledonia and the spine-tingling experience of standing where those brave Caledonians stood. Amazingly, there are still artefacts, the evidence of their presence long ago, fading like a lost lament. This is a wonderful, haunting and beautifully written book. Go on. It’s nearly Christmas. This life of ‘The Great Defender’ and Conservative MP Sir Edward Marshall Hall KC (1858-1927) is a fascinating read, beautifully written by another English silk, Sally Smith QC. Smith has researched every facet of Marshall’s life (as he was always known), from his childhood in Brighton and public school days, to his plethora of correspondence and the minutiae of his famous cases. But whereas detail can often cloy a good narrative Smith brings a lightness of touch and leads you on through Marshall’s extraordinary life and work, his rebellious nature never far below the surface. Smith, herself a highly accomplished advocate in criminal and medical law, paints the entire canvas in its Edwardian glory: cognac in smoke filled London clubs, night sittings in Parliament then straight to court, and black tied theatre impresarios interrupting the evening’s performance to announce the verdict in Marshall’s latest trial. And then there’s his intriguing private life including two marriages, many mistresses and the ghastly death of his first wife and the trial of her killer. Smith’s enthusiasm for her subject is infectious, and the book is all the more readable for it: and what a character he is to consider – because for the first twenty-five years of the twentieth century Marshall was quite simply the most famous trial counsel in England, beloved by the public and bewitching to jurors, but all too often clashing with the bench and then roasted by the press. His wit was legendary (Judge: “Mr Marshall Hall, is your client familiar with the doctrine res ipsa loquitur? Marshall: “My Lord, in the remote hills of County Donegal from where my client hails they speak of little else.”), but it came at a price. Was Marshall Hall the greatest advocate of them all? Certainly Lord Birkett included him in his roll call of history’s six outstanding advocates (together with Patrick Hastings, Edward Clarke, Rufus Isaacs (who in 1898 took silk with Marshall), Charles Russell and Scotland’s own Thomas Erskine): and while in the final analysis he may not have been in the first rank of legal minds, he was certainly the consummate trial counsel. Smith shows us every angle of this complex man, but most interesting of all are his cases: the ‘Brides in the Bath’, the Green Bicycle murder, murder at the Savoy, the Poisoning of Mabel Greenwood and the Crumbles murder; the names alone read like an Agatha Christie novel. These cases enthralled the nation, and Smith’s narrative affords us the best seat in the courtroom. One striking photograph, which seems to encapsulate just how the justice system operated in those times, shows a workman laying down sawdust in order to silence the passing traffic; and meantime the public both in and out of the courtroom knew it was Marshall ‘the Great Defender’ who held the brief. After Marshall’s death in 1927 aged 68, Edward Marjoribanks brought out a wonderful albeit rather romanticised biography which was published in 1929 and went through eleven reprints in three years such was the interest. Since then, however, there has been relatively little on the man himself, though much has been written of his cases. With the distance of time therefore and its scope, Smith’s book is the definitive work on Marshall, and deservedly so. Nevertheless the last words go to Lord Birkenhead who provided the foreword to Marjoribanks’ 1929 The Life of Sir Edward Marshall Hall (and I’ll leave you to discover Clive Anderson’s entertaining foreword to Smith’s work), which in their proximity convey so much. 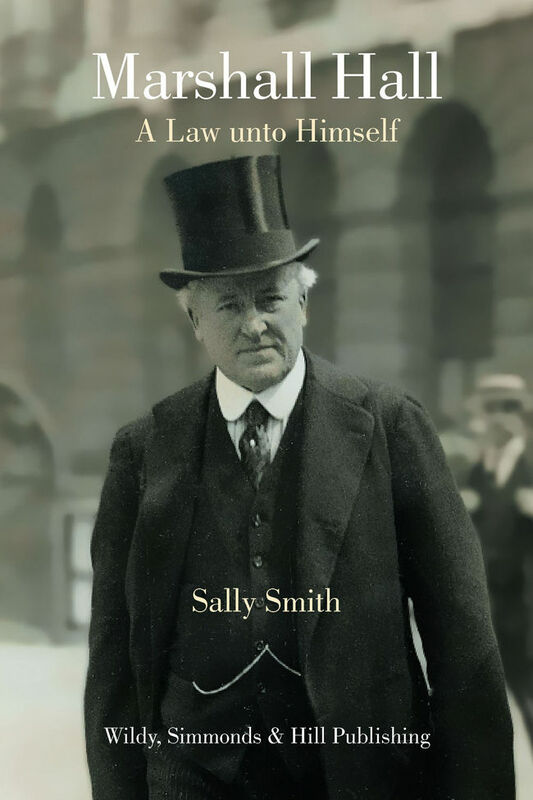 Marshall Hall: A Law Unto Himself by Sally Smith QC, foreword by Clive Anderson. Pub by Wildy, Simmonds & Hill, 302pp. £25 (Hardback). The Ox-Bow Incident, by Walter van Tilburg Clark (Penguin, 1940 – my dad’s copy, photo attached below) is, I readily admit, a book rarely read these days – at least on this side of the Atlantic; for years, however, it has been a staple text in many American high schools, for the simple and powerful insight it gives into a world where justice and patient inquiry are left behind by anger, retribution and mob rule. It’s as gripping a read as Truman Capote’s fabulous ‘In Cold Blood’, and just as raw. The weekend before Easter I was visiting my parents in Donegal, and playing a few rounds at the breathtakingly beautiful Ballyliffin golf course, during that spell of great weather we had then. I was accompanied by my Italian friend Roberto, to whom the experience of playing an Irish golf course was entirely new. “They tend not to have sheep on golf courses in Italy,” he frowned, as the sheep meandered about on the links; but he seemed to enjoy it nonetheless. My parents’ house is stacked with old books and before dinner, to distract myself from all the golf balls I had lost earlier, I rummaged through a few. My dad appeared and pressed an old Penguin classic into my hand. “Read that,” he said smiling, “then tell me what you think.” Well, I read it and thought it superb. Set in Nevada in 1885, two cowboys mosey into the sleepy town of Bridger’s Wells and quickly settle in at the whiskey saloon. There’s been cattle rustling, and the townspeople are suspicious of everything and anyone. Nerves are jangled and tempers frayed, when suddenly news of a killing at a nearby ranch spills through the swing doors. Despite the uncertainties, the menfolk quickly form themselves into a posse. The aim: to lynch the perpetrators – and so off they set, deaf both to the local judge’s warning that the law should prevail and the opposition of a vocal minority, stated with courage. The pursuit and capture of three men suspected unfolds with great power and pace, while the character and motivation of each man involved is brought starkly to life. Will any of them have the guts to do it, when it comes to the rope and a tree? Could any one of them live with the consequences of their actions, … or inaction as a passive observer? In the modern world, this brilliant novel is a reminder of the extent to which we can take the systems of law and order for granted, and how ultimately we must each stay awake and bear witness to truth and justice. And if you like good old fashioned cowboy stories, you’ll love it. It’s available on Amazon http://www.amazon.co.uk/s/ref=nb_sb_noss_2?url=search-alias%3Daps&field-keywords=the+ox+bow+incident or can be sourced in a good second hand shop, like Caledonia Books on Glasgow’s Great Western Road. http://www.caledoniabooks.co.uk/ The book was also made into a 1943 Oscar shortlisted film, starring Henry Fonda; and don’t worry dad, I’ll be sure to return it: after all, it’s a good reason to get back over to glorious Ballyliffin. … from the days when books were books!